Before leaving for work this morning I roasted three poblano peppers. I figured this would cut down on the time it would take make the chili rellenos once I got home. And a spicy tomato chili sauce. I used my old standby recipe but topped the rellenos with Rick Bayless's Quick Cooked Tomato-Chili Sauce. 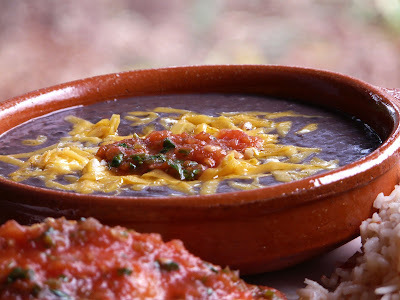 The black beans were a bastardized version. I didn't have time to cook beans so I opened a can of black beans and put them on to simmer with a couple of slices of smokey bacon, a little cumin, minced garlic salt, pepper and a little chicken broth. Simmered for about 15 minutes and then pureed in the blender. (remove bacon first) Topped with a little shredded cheese and the tomato chili sauce. I have been making Chiles Rellenos for about 30 years. I have never had an actual recipe. I just watch someone I knew (from Texas) make them and have been making this way ever since. Cut cheese into finger size pieces. Carefully shove the cheese stick into a pepper being careful not to split it. Heat about 1 inch of oil in frying pan. Beat the egg whites until medium stiff peaks form. do not overbeat. Beat egg yolks with salt, pepper and the tablespoon on flour. Dip the pepper stuffed with cheese into flour and then into the egg mixture. Carefully add to the oil. If needed, spoon a bit of the egg mixture on top of the pepper while in the pan. (these fry quickly), flip over and fry other side. Remove and drain on paper towels. Continue cooking until all of the peppers are cooked. 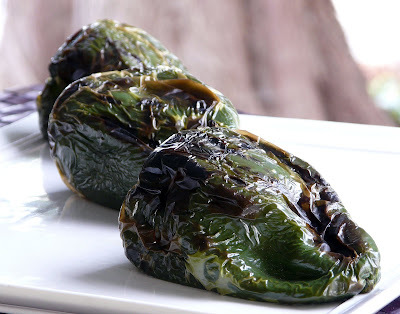 Serve Chili Relleno with sauce on the side OR Place the fried chile rellenos in a casserole dish and pour the sauce over them. Bake in a 350 oven for 20 to 30 minutes. Place the tomatoes, peppers, onion and garlic in blender and pulse. Puree leaving a little texture. Heat oil in sauce pan. Add tomato chili mixture and simmer until the sauce thickens. About 5 minutes. Remove from heat and seaon with salt and add the cilantro . Ann, you have me hungry for Chili Rellenos. Your dinner looks so good! My nose is twitching in spicy anticipation, grins. Looks delicious. I roasted some last week for the first time. I thought they were suppose to be mild, they lit us up!! LOL!! Question after roasting the pepper how do you remove skins/seeds and add cheese without splitting the peppers? Mine always split in multiple places making it hard to keep cheese in when frying. wow.. these look absolutely AMAZING!! Thanks for sharing, I will definitely try these! Lori, if I lived in your State I wouldn't have to make them. Katy, I hope you give them a try. Tien, it would be even better made with peppers that came from your own garden. Bethie, sometimes they do surprise with big heat. Donh, you have to be careful but it can be done. I put a slit down one side and rinse the seeds out under the tap. Just a gentle stream of water. I slide a "bar" of cheese into the pepper and close with a toothpick. I know that some recipes call for grated cheese but I've always found a finger size piece of cheese works best. Even if your peppers split the batter should hold them together. 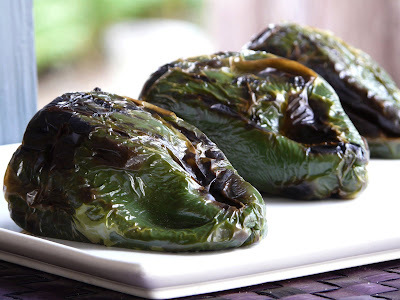 These are really called "Chiles Rellenos" since they are chiles not chili (the bean soup). 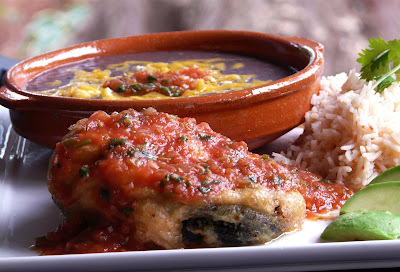 Anyway, your chiles rellenos look delicious! My girlfriend loves this stuff! Memoria, thanks for pointing out the spelling error in my title. You will notice that the recipe is correctly titled. I think I will leave it as is though. That way when someone does a google search even if they spell "Chiles" wrong they will still find my recipe. 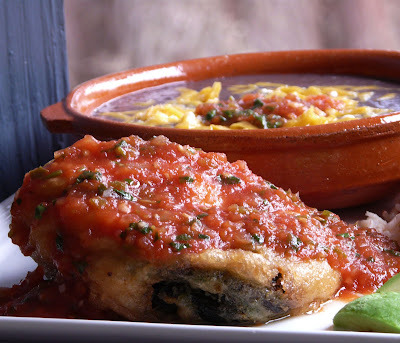 Those chili rellenos look so tasty!